I’ve been off on another week of space-related adventures that took me across the entire North American continent. 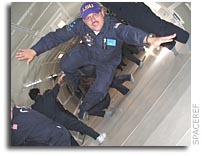 On the East coast, I took a trip with teachers on the Northrop Grumman Weightless Flights of Discovery. The inspiring experience is documented here by our friend Keith Cowing for SpaceRef. Next, I was off to “Experience the Future” at Wired NextFest in LA. One of the big exhibits showcased the new Google Lunar X PRIZE, a robotic race to the Moon to win a remarkable $30 million prize purse. I even got a picture taken that will fly to the moon!! Also on display were exhibits from NASA centers, including a cool interactive touch-screen wall from Marshall Space Flight Center. We’ll cover all this and more in our next episode. Stay tuned!